If you’ve stumbled across my website, read my work, liked an article or even commented, chances are you really like comic book themed video games. If you’ve become a fan, first of all, thank you from the bottom of my heart, and secondly I’d like to tell you about a great book that looks at comic book games in an incredibly unique and entertaining way. Titled WRONG! 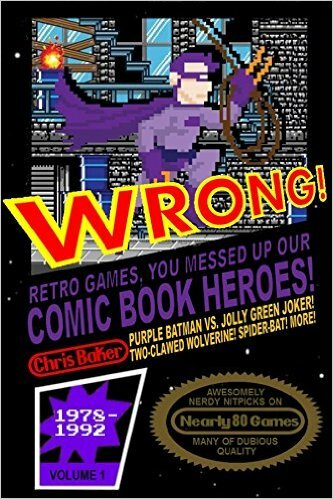 Retro Games, You Messed Up Our Comic Book Heroes!, the book isn’t about how good or bad comic book games are, but how once upon a time they totally misled a lot of young people who were learning about characters like Batman, Spider-Man, Wolverine and the rest of the X-Men for the first time. Unlike my work which is written by a fan of comic book games above all else with no real formal training in writing, the author, Chris Baker, has actually been behind the front lines to see how the sausage was made. Baker is presently doing PR and social media work for the free-to-play MMO Marvel Heroes but has worked in the video game industry for well over a decade, writing for publications like Official PlayStation Magazine. Baker also worked for Lucasarts before they were bought by Disney as well as Marvel’s game division at a time when games like Lego Marvel Super Heroes were coming to market. So really, if there’s anyone you can trust to cover this material both passionately and faithfully, it’s Baker. The book spans the years 1978-1992 when both comic book and licensed games were just starting to come to market. Covering the days of the Atari through to the early days of the Sega Genesis and SNES as well as everything in between, Baker examines exactly what he learned from each game and how this was later turned out to wrong. Things like Batman being purple in the Sunsoft NES game when black would’ve been just as acceptable; How Wolverine not only had only two claws in his NES solo debut, but for multiple years after that and how video games have wronged the character of Juggernaut for decades until he was finally done right in a pinball game. Those are just a few of the examples of the nearly eighty games covered in the book. There’s also some great trivia inserted for a lot of games that made me saw aloud more than once “I never heard about that!”. WRONG! Retro doesn’t stop at comic book games, however, it also looks at titles based on properties I. like many I’m sure, grew up with like Transformers, Masters of the Universe and G.I. Joe. WRONG! Retro (It’s way too hard to keep typing out the full title) reads less like a book and more like a feature in a magazine stretched to a full issue, which reflects Baker’s background writing for video game magazines. This shouldn’t be taken as an insult to Baker though, as I don’t mean to say that this style of writing is beneath a collected book or bad, because it’s neither. The book is very informative, but it’s also highly entertaining and that’s exactly what Baker set out to do. Normally I’m not a person who enjoys reading or watching anything that involves heavy nitpicking, however Baker is not spending the book stroking his ego over how much he knows or being angry, but poking fun with elements of games that most people wouldn’t bat an eyelash out. It never really bothered me personally that Batman was purple, because the game was so much fun and the cast of the Uncanny X-Men having low willpower was the least of that game’s problem, for example. It could also be that I’m a sucker for this type of material as I grew up with magazines like the one Baker used to work for and miss them from time to time, but I feel the way the book is laid out is wonderful. Sandwiched between Baker’s words are bright and colourful screenshots of the game’s he covers so you get a clear snapshot of every game if you have never heard about it, and that happened a lot, even for me. It also makes it great for every type of reader, whether you’re the person who likes to sit down and go from cover to cover, or only has an opportunity to read a chapter or two, or even a page or two, at a time. Like a magazine, you can also easily find whatever game you want thanks to bright, bold titles. If you say, wanted to show something to a friend, find a favourite passage, or just jump straight to the TMNT days, it’s incredibly simple to do so. There is a table of contents that breaks down each year covered, however the book is laid out so cleanly that you almost don’t need it. When I started this website, I was told by more than one person that one of these days you’re going to eventually run out of things to talk and write about. WRONG! Retro shows that you can look at similar material in a completely different way and do so in a very entertaining manner. Chris Baker, like a lot of people, learned about comic book heroes from animated series, movies and video games before they even read a single issue, and it’s funny to think just how off course we were steered in our formative years. Why couldn’t Wolverine fire lasers when he rubbed his claws together and why couldn’t Colossus create a giant spark by screaming? These were things I never questioned but see as downright silly now. You can download WRONG! Retro from the Amazon Kindle book store at a relatively low-cost, so if you’ve liked anything I’ve written here, or just want to read a great book that rips apart games based on your favourite comic book characters, there’s no reason not to download it. 04/05/2016 in Review. Tags: books, comic books, comics, review, video games, WRONG! Retro games, you messed up our comic book heroes!